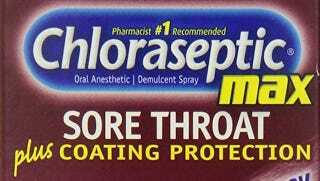 In the case of Chloraseptic Max Sore Throat Spray, the “max” means “actually does something” beyond dumping a bunch of sweetener down your throat. As someone who suffers from chronic sinus issues, I’ve certainly experienced my share of sore throats, and I had long since given up on sore throat sprays being any more effective than sour candy sprays for pain relief. Chloraseptic Max is instantly and highly effective. It’s the strongest thing short of a prescription you can get, with 1.4% phenol as an analgesic and 33% glycerin to coat the area. The targeted nozzle also makes a world of difference.